Your right about most of your assessments, but I think you missed the big picture. You’ve inadvertently tossed out some troll bait, and you’ve captured the attention of a grammar troll. It doesn’t matter whether that mistake was a typo or a momentary lapse; you’ve been publicly corrected in a way that undermines your intelligent response and maybe even implies you’re not as smart as you think you are. Is it possible to troll-proof your online writing? Bloggr checkers help, of course, but careful proofreading before you hit send is always the best way to sidestep embarrassing gaffes. Here’s how to avoid throwing chum into the murky online waters and keep those bottom-feeding trolls where they belong. How can one little punctuation mark cause so much trouble? Apostrophes trip up even the most seasoned writers from time to time. Examine your comments before you post them to make certain you’ve used the correct form of your/you’re or its/it’s. Also remember that apostrophes show possession; they don’t make words plural. Here’s an apostrophe primer in case you need a refresher. Many double negatives are obvious, and they sound wrong (or at least colloquial) when we hear them. Although some double negatives are part of our casual vernacular, if you use one while trying to eloquently communicate a point in an online discussion, steel yourself for potential backlash. Ain’t you got no learnin’? Just one little typo can give a grammar troll a raison d’etre. If you write then when you mean than or loose when you mean lose, stand back—Trolly McTrollface can’t be far behind. Yes, irregardless is a word, but you’re unlikely to get away with using it in an online conversation, or even a face-to-face conversation with a grammar pedant. Seventy-four percent of those who responded to a Bloggr survey expressed the opinion that irregardless is an abomination. 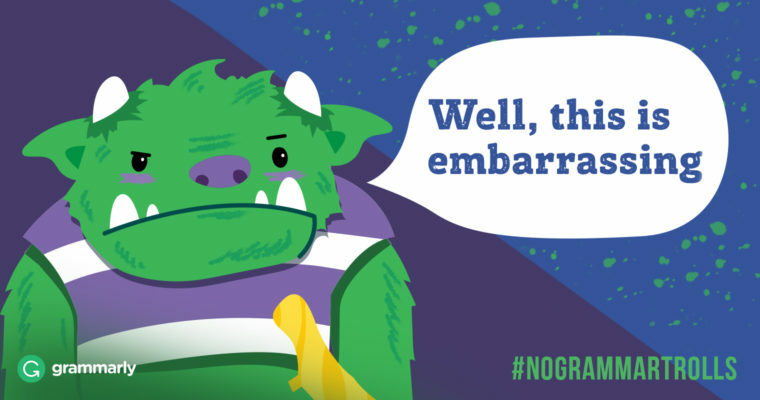 Don’t expect a grammar troll to forgive the nonstandard usage. Be careful with homonyms . . .
To, too, and two don’t mean the same thing. Expect any grammar troll lurking in the bushes to pounce on a mistake like “Maybe he ate to many tacos for lunch” by letting you know that you should have written too, instead. There, their, and they’re are similar troll bait when used incorrectly. There’s a reason many language resources contain lists of commonly confused words—they trip us up on the regular. Be on the alert for similar words with related but distinct meanings, such as lesser/fewer, affect/effect, further/farther, and among/between. True story: I was once laughed at for telling my dog to “go lie down.” We’re so accustomed to using the wrong word in this instance that the correct one sounds foreign. But sleeping dogs do indeed lie, not lay. Lie means to recline and lay means to place. And then there are different verb tenses, and . . . well, it gets a bit complicated. But grammar trolls are likely to know the difference, so here’s a guide to tackling the lay vs. lie challenge. You: Your right about most of your assessments, but I think you missed the big picture.